Imagine a visual, slightly interactive art piece that shows the Chicago L tracks using live data over the internet. Today, this exists, and is the creation of Windy City Lab (WCL), a partner company of the Chicago Connectory. Windy City Lab is one of many partners and start-ups that work from the Chicago Connectory. WCL was formed in 2014 as a digital maker space for IoT start-ups. The lab provides consulting and workshops on all aspects of building smart physical products that tie into the cloud and one's phone. Its mission has always been to help ensure its clients' products are successfully built and deployed in production. Additionally, WCL has worked on its own products, specifically one major initiative called "Glance," an internet-connected smart mirror. As for the art piece itself, the original Windy City Lab logo was meant to look like a printed circuit board (PCB) and the traces were drawn out to match the CTA downtown loop tracks, said Kevin McQuown, principal engineer for Windy City Lab. 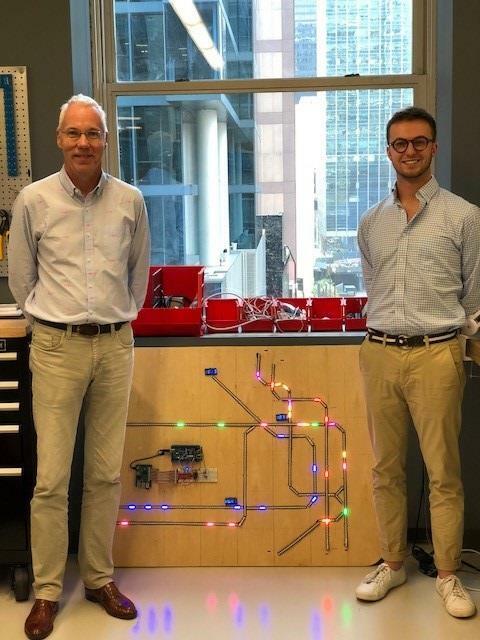 "At that time we decided to make a large version of our logo using RGB LEDs and tie it into the actual CTA tracking system to show where all the trains are with the correct colors based on the specific line," Kevin said. "This large display was meant to attract folks to WCL (we were originally a tenant at Catalyze, the pre-cursor to mHub) as both a conversation piece and a technology demonstration of microcontrollers connected to the cloud." Windy City Lab is working on different business models to introduce their piece of art to the market and are already thinking about similar models for different major global cities. Besides the loop tracks project, WCL is always busy working with a variety of clients. They played a key role in the software and hardware development for GuardLlama, a panic device that a person can carry in their pocket. WCL also created a three-week intensive summer program for gifted high schoolers that is delivered as part of the Center for Talent Development at Northwestern University. The program teaches both hardware and firmware development where the students create a “smart cube” that plays music, reads temperature and humidity, and measures its orientation with a 9DOF Bosch sensor, which can be integrated via bluetooth to one's phone and WiFi to the cloud. Other current projects include work with Hermes, a Bosch group focused on urban mobility, and Pavan, a start-up out of the University of Chicago that focuses on pollution sensing in third world countries. Kevin will be hosting free tech talks along with running the Connectory Prototyping Lab. And as for working from the Connectory itself, it holds a special place in Kevin's heart, he said. "I love being at the Connectory because I feel we can add some significant value to other IoT start-ups here," Kevin said. "Also, it gives us great exposure to local universities and city programs, which can only help us drive our consulting business with those clients." For more information about Windy City Labs, please click here!